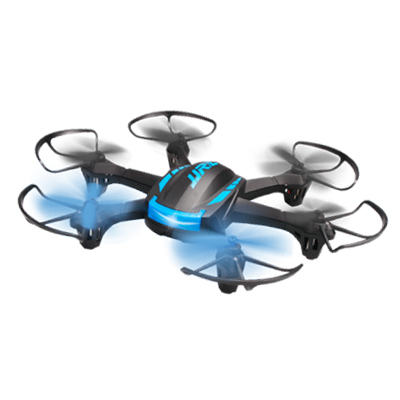 JJRC Announced H21 Mini Hexacopter (Quadcopter). The first glance of H21 looks refreshing and seems to be specifically designed for beginners for both indoor and outdoor flying. For me,the face of H21 reminds me of the famous JJRC H12C Quadcopter. As Evident from the below picture, the H21 is a mini Hexacopter measuring 25.5 * 18 * 3.5 Centimeters with built-in six-axis gyroscope, 2.4 G remote control technology and 3D rolling ability. One Key automatic return, CF Mode (Also called as headless mode) and the bright LED lights are few highlights. 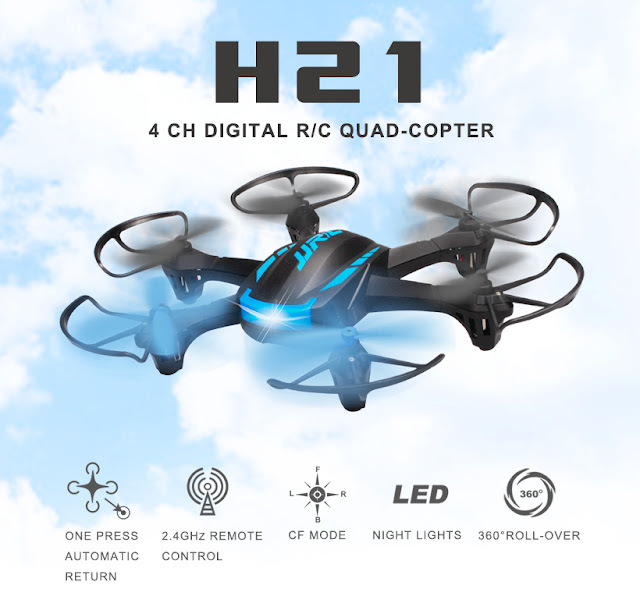 As per the specifications , H21 will be primarily available in Black and White colors with a combination of Blue color branding at the top along with the blue and black color propellers. The LEDS in blue look bright for casual night flight. Featuring no camera, the flight times is 6 minutes and operates with 3.7 volts 500 mAh Lipo battery, with a charging time of about 60 minutes. If you are wondering why only 6 minutes flight time with 500 mah battery ? to answer that, its basically a hexacopter with 6 motors drawing the power. Though H21 hexacopter does not include a camera feature, the closer looks at the transmitter reveals that the camera and video icons (buttons) are return to home and headless mode functions respectively. which makes me think that the transmitter is clone of some other drone. As this is fairly new, the price of the H21 is yet to be listed. on a quick note, this mini hexacopter looks promising for a better quad flying experience! I'm very dissatisfied, the 360 rotation is very slow and went less than 20 meters lost control plus each battery use only lasted about 5-6 minutes at the most.